The Geology Department has a tradition of Departmental field trips that explore the landscape and geologic underpinnings of many locations in the mid-Atlantic region. This field trip is open to all, involving curious students in their first geology class as well as a core of seasoned students and a cadre of faculty. Last weekend the Geology Department left terra firma and set a flotilla of canoes loose upon the James River along a stretch of river in the central Virginia Piedmont. Friday evening we arrived at our campsite situated on the floodplain of the James and discussed great floods from years gone by. High above the campfire banter Jupiter chased the waxing Moon westward across the clear sky. Our late night slumber was repeatedly disturbed by the shrill sounds of trains coursing along the rail line whose tracks take advantage of the low-grade along the river’s floodplain. On Saturday morning the less-than-well-rested crew was eager to get the boats on the water. But there were academic questions to consider. Is the lazy river, in its low-flow late summer condition, doing any geomorphic work? What can be learned about the geologic history from the outcrops jutting from the river? Leave it to William & Mary faculty to bugger up a perfectly relaxing weekend float trip with geologic questions. We launched 22 canoes onto the James and more or less pointed our bows down river. A kilometer into the float we swarmed a mid-river outcrop exposing conglomerate, a chunky sedimentary rock, and pondered its depositional setting way back in the Triassic period (~210 million years ago). Further into the float we drifted with the current, releasing citrus fruit (a low tech marker) into the flow to measure the river’s velocity. The James, discharging just under 600 cubic feet per second -its lowest rate for all of 2010, was a boney river and finding the right course proved challenging. 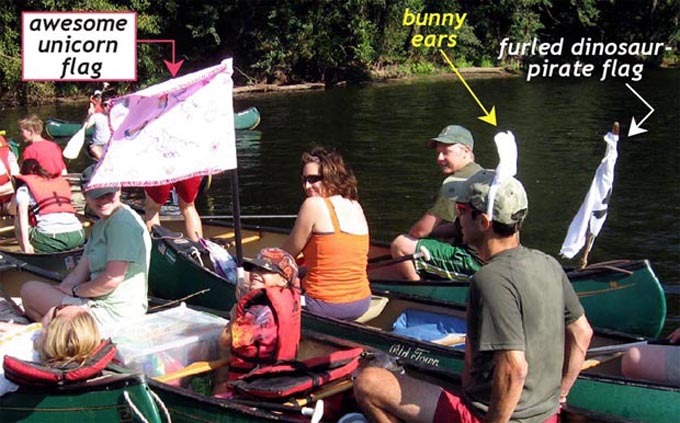 Many canoes were emblazed with banners including a dinosaur pirate motif, a magic phone booth, Fred Flintstone’s iconic mug, and even a first-rate unicorn standard. As the freak flags flew and the day warmed epic water fights between boats ensued. Our lunch stop was on a low cobble-covered islet exposed only at low water. Here we stuffed our faces with food, ferreted out the origin of the cobbles, examined outcrops of dark diabase (an igneous rock) intruded into the sedimentary bedrock, and estimated the dissolved stream load. Although the James was flowing low and clear, it was silently transporting cations (+ ions) (Ca+2, Mg+2 and others of their kind) on towards the Atlantic Ocean. 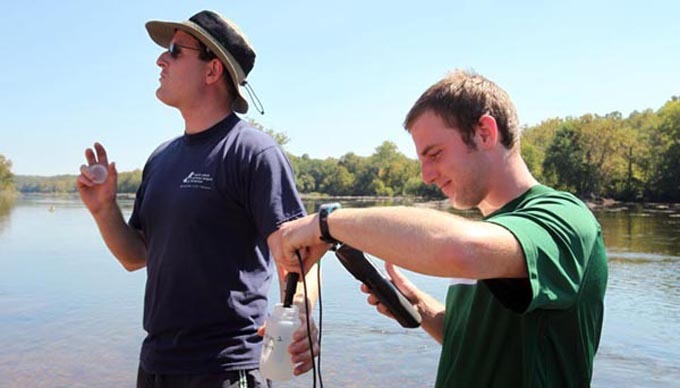 For every liter of water floating down the James we measured 65 milligrams of cations (+ ions) this is approximately balanced by an number of anions (- ions), these are mostly bicarbonate ions (HCO3-1), whose greater mass brings the total dissolved load to about 200 milligrams per liter. For most of us, awash in sunshine and caught in a post-lunch torpor, 200 milligrams per liter was meaningless, but Jim Kaste, our geochemist, brought us to our geologic senses. 1 cubic foot = 28.3 liters, thus 580 cubic feet/sec x 28.3 liters/cubic feet = 16,400 liters/sec. 16,400 liters/sec x 200 mg/liter = 3,280,000 mg/sec. 1 kg contains 1,000,000 mg, thus 3,280,000 mg /1,000,000 mg/kg = 3.280 kg. Every second the James carries over 3 kilograms of dissolved load downstream. Our float trip lasted seven hours. During our leisurely float how much dissolved load went down the river? 7 hours x 60 min/hour = 420 min x 60 sec/min = 25,200 sec x 3.280 kg /sec = 82,700 kg. Ok, nearly 83 thousand kilograms seems plenty big, but just how many dump trucks would be needed to carry that load. A standard tandem-axle dump truck hauls between 12 and 15 tons (11,000 to 13,500 kg). Good gracious! While we floated, the river carted away about 7 dump trucks worth of matter (matter that somewhere upstream had been solid rock) and that is in addition to all the water. This lazy river is doing work (even on a Saturday) in a silent fashion that removes rock (dump truck loads per day) in a dissolved state from the drainage basin and transports it seaward. The rapids loomed after lunch. All the canoes got through, but not all canoes or their occupants stayed dry. At the base of the second set of rapids we clambered back onto the rock to debate its origin. The rapids are the stair-steps in the river profile better known to geologists as knickpoints. Streams typically develop steeper slopes as they flow over harder rock. All three sets of rapids on the trip are localized on diabase, a dense and notoriously tough rock. The debate as to whether these knickpoints are stationary or migrating was contentious. 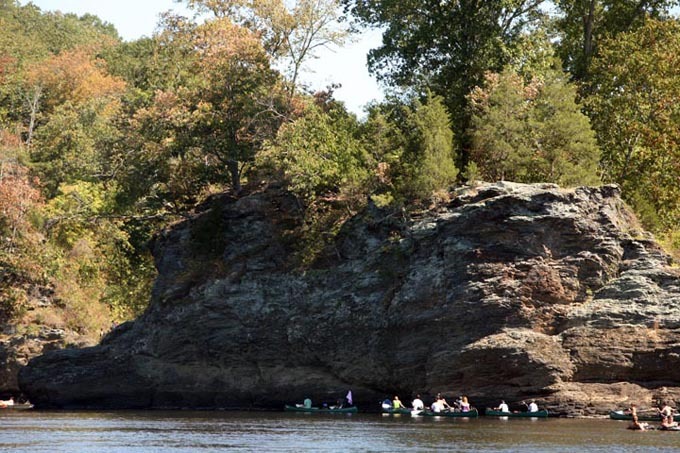 We perused Paleozoic metamorphic rocks from our canoe seats while gliding by cliffs at the aptly named Rock Island. We considered the competing processes at work creating and destroying mid-channel alluvial islands. We had more water fights and the faculty got soaked. We were drenched in sunshine. It was a glorious day to be on the river. Over the years Geology departmental trips have gotten William & Mary students to the high points in the Appalachians, to the bottom of rock quarries, and out into the Atlantic surf on Virginia’s Eastern Shore. These trips are unique as they bring together the W&M geologic community in a way that staying on campus never could. 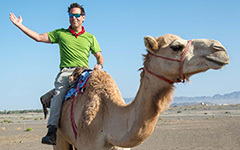 These trips also attract an array of students, from sociology and business majors to hard-core geology and environmental studies students, because they provide a delightful change from classes and campus. Paddling down the James contemplating stream processes and admiring the bedrock made for a memorable trip; no doubt the Geology department will take to the water and float again in the future. Why are there no outcrops in bumpass? oh and your blog rocks. As a geology 110 student, this was a very educational and enjoyable reading experience. I even learned why knickpoints are formed, which was a question posed to us the other day in class. I think the geology department field trips are a fantastic idea. I would really like to be a part of the next field trip! OMG this helped so much with the problem set number 8. Looks like a fun trip; I’ll plan on going on the next one! Unicorn flags forevaaa! Very interesting stuff.